I've always wanted a kitchen table with a bench. Posted on Craigslist Free, yes FREE, was a corner breakfast nook with a bench. Unbelievably, free! Its probably an IKEA brand given its simple, lightweight construction and the way it pieces together. One of the seats was busted underneath...probably from a kid jumping on it. That was a simple fix by removing the seat and replacing the board and padding under it...I had all those materials so a free fix for a free find. After much water and soap we had our breakfast nook and bench. Given the activity level in my home, the bench was constantly tipping over, getting shoved under the table and forgotten, or "in the way" when placed against the wall in an effort to get it "out of the way." The bench couldn't win. It landed in the corner of the basement where things go to die. Along came spring and the building of our Redneck Deck and new garden. And along came a desire for some fun patio seating. Wouldn't a bench look nice? 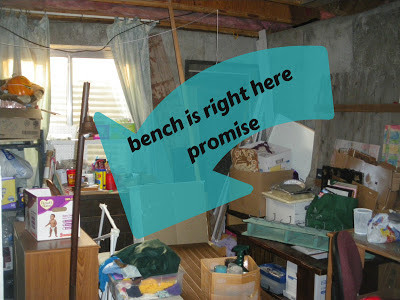 Wait, don't I have a bench? After some digging through my hoarder-style basement, the bench was resurrected and given new life. 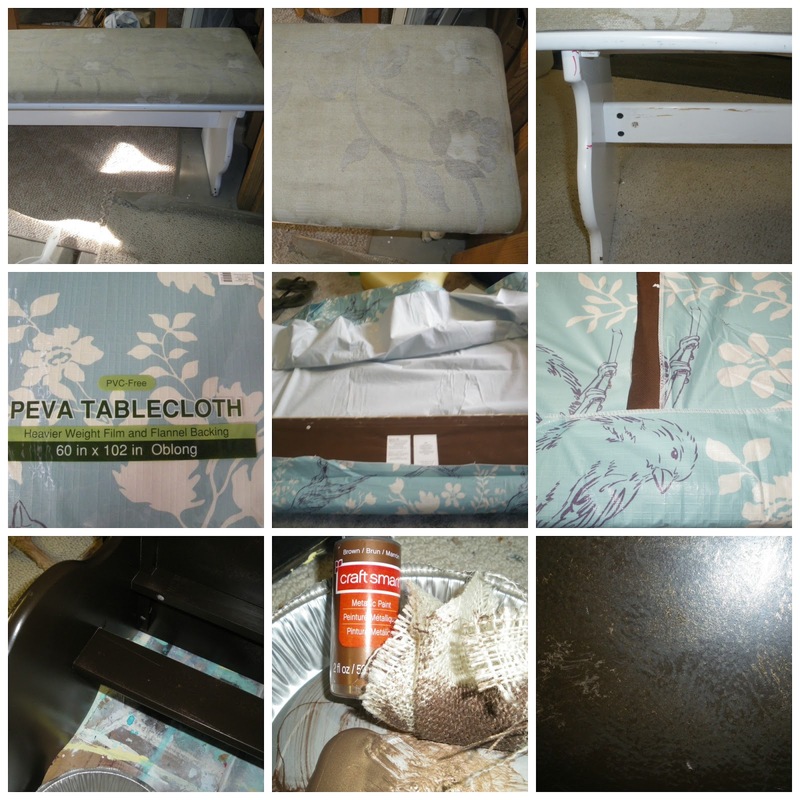 Top Row: Bench before, cover worn and faded. Middle Row: Tablecloth picked up at BigLots on sale for about $3.50. Cut and attached with staples, make for easy removal for a change-up. Bottom Row: Spray paint from my recent raid for freebies at the local Hazmat. I really love the shade of brown but it didn't match our existing patio table and chairs. Metallic brown paint was dabbed on with burlap to create a textured look. Love how the light bounces off the metallic paint. Why tablecloth? I wanted something that was water resistant and easy to clean. This is where we'll eat Popsicles, juicy watermelon, ketchup-loaded-hotdogs, and cup after cup of lemonade. I'd rather not fuss over the inevitable spills and just enjoy the memories-in-the-making of summer outside. And, if it get really stained, or ripped, or beaten up by the surprise hailstorms, there is extra table cloth to replace it. Or, we can just get another tablecloth and change up the color scheme. Time to host a BBQ. Or just simply sit outside with the kids and enjoy the updated backyard. Beautiful transformation! I hopped to your blog from a link party.. love your ideas here. What a cute and easy idea. I love it! what a great idea. I have a laundry basket with a top similar to the bench top and it's been scratched up by cats. I was just telling my husband i wanted to give it a makeover but didn't know how...this will be great!!! Cute, cute, cute, enJOYed. Found you over at "Make it Blue Friday." Like your blue. You did a wonderful job! Thank you for linking up at Hickory Trail!